Housekeeping and cleanliness at the workplace are closely linked to the industrial safety. The degree, to which these activities are effectively managed, is an indicator of the safety culture of the organization. Housekeeping and cleanliness not only make the organization a safer place to work in but also provide a big boost to the image of the organization. These activities also (i) improve efficiency and productivity, (ii) helps in maintaining good control over the processes, and (iii) assist in maintaining the quality of the product. These important aspects of housekeeping and cleanliness are shown in Fig 1. There are several signs which reflect poor housekeeping and cleanliness at the workplace in the organization. Some of these signs are (i) cluttered and poorly arranged work areas, (ii) untidy or dangerous storage of materials (such as materials stuffed in corners and overcrowded shelves etc. ), (iii) dusty and dirty floors and work surfaces, (iv) items lying on the shop floor which are in excess or no longer needed, (v) blocked or cluttered aisles and exits, (vi) tools and equipment left in work areas instead of being returned to proper storage places, (vii) broken containers and damaged materials, (vii) overflowing waste bins and containers, and (viii) spills and leaks etc. Housekeeping and cleanliness refer to the processes which ensure facilities, equipment, work areas and access routes are kept in good condition. This condition is required for supporting safe and reliable operation and maintenance during normal plant operation. Additionally, during the emergency, housekeeping and cleanliness ensure that the plant operations are not inhibited. Further, the housekeeping and cleanliness both are interrelated. Reaching a good standard in one of them is difficult without reaching a good standard in the other. Housekeeping and cleanliness promotes efficient production and a good working environment at the workplace. In fact, efficient production and a good working environment are complementary to each other. The elimination of inefficiencies and accident hazards caused by unfavourable conditions in and about the workplace is necessary in getting the job done properly and safely. The attention to these important details, which are often overlooked at the workplace not only contributes to safe working but also has a big positive effect on the employees’ productivity. Good housekeeping and cleanliness involves every phase of the operations and are necessary to be applied throughout the entire area at the workplace. These activities require orderly conditions, the avoidance of congestion, and attention to such details as an orderly layout of the whole workplace, the marking of aisles, adequate storage arrangements, and suitable provision for cleaning and maintenance. A clean, well-ordered, attractive work environment sets the tone in which the work is enjoyed by the employees. It encourages tidy work habits in employees. It helps reduce their fatigue. It promotes good relations between employees and management. It gives a lift to morale, which is reflected in the quality of production and overall efficiency. Since good housekeeping and cleanliness also leave a good impression on the organizational visitors, hence these activities promote the image of the organization. Customers and the other stakeholders of the organization have more confidence in the organization since they notice that the work is being carried out efficiently in clean, pleasant, and well-ordered surroundings. Housekeeping and cleanliness practices generally reflect the attitude of the management towards healthy practices. Good housekeeping and cleanliness reflects pride in the workplace, which signals that the organization has a healthy work culture. This is important since a healthy work culture provides an environment at the workplace where the employees are not only at home with their work but they enjoy the work and hence their work efficiency gets a boost. The responsibility of housekeeping and cleanliness lies both with the management and the employees. Periodic and panic cleanups are costly and ineffective and do not improve work environment where the employees can give efficient performance. Good housekeeping and cleanliness mean that there is an effective management of the workplace. This effective management is the reason for the better performance, increased productivity and better control on the product quality. Good housekeeping and cleanliness also reflect systematic storage of the materials, neat and tidy work areas, and systematic movement of the men, materials and machines, as well as adequate workplace illumination. With these practices, workplace can be kept safe from potentially dangerous objects or substances present in the work environment. An organized and clutter-free work area also makes it easier to respond to or evacuate in the event of an emergency. Good housekeeping and cleanliness normally results into (i) a workplace which is cleaner, safer, well organized and more pleasant for work, (ii) improved utilization of floor space, (ii) smoother and systematic workflow with substantial reduction in non-value added activities, (iv) better inventory control of tools and materials, (v) reduced handling to ease the flow of materials, (vi) reduction in wastages of materials, (vii) more efficient equipment clean-up and maintenance leading to lower break-downs, (viii) minimization of errors leading to better products, (ix) safe environment for work and lower exposures of employees to hazardous substances (such as dusts, and vapours etc. ), (x) more hygienic workplace conditions which lead to improved health of the employees, (xi) improved overall look and feel of the work environment, and (xii) improved morale of the employees. Poor housekeeping and cleanliness, on the contrary, creates workplace hazards which lead to various accident such as (i) slips, trips and falls, (ii) caught in-between objects, (iii) struck by falling objects, (iv) struck by moving objects, (v) cut/stabbed by objects, and (vi) struck against objects. Furthermore, poor housekeeping and cleanliness also create fire hazards which inevitably lead to increased fire risk. Starting point for housekeeping and cleanliness in the organization is the setting of the housekeeping and cleanliness practices and then training the employees in those practices. These practices are to have clear objectives which are practical and attainable. The practices are to comply with the regulatory norms and requirements. These practices are to be safe and simple so that employees are motivated to follow them. Good housekeeping and cleanliness practices plan and manage an orderly storage and movement of materials from point of entry to exit. They include a material flow plan which ensures minimal handling. The plan also ensures that work areas are not used as storage areas. This avoids the employees moving the materials to and from work areas as needed. Part of the plan can include earmarked area for different materials and frequency of material disposal from the earmarked area. This step at workplace results into the elimination of repeated handling of the same material and more effective use of the employees’ time. Often, ineffective or insufficient storage planning results in materials being handled and stored in hazardous ways. Knowing the shop layout and the movement of materials throughout the workplace helps in planning of the work procedures. Employees’ training is an essential part of good housekeeping and cleanliness practice. Employees need to know how to work safely with the products they use. They also need to know how to protect other employees such as by posting signs (such as ‘wet – slippery floor’ etc.) and reporting any unusual conditions. The practices of housekeeping and cleanliness are to be ‘maintained’ and not ‘achieved’. To be effective, these practices are to be used on a regular and continual basis by the employees in the organization. One way to ensure that these practices are followed at the workplace is to integrate them with the job responsibilities of the employees. For housekeeping and cleanliness practices special attention is needed for the places which are ‘out-of-the-way’ or which are unmanned since without special attention these places are likely to be overlooked. The orderly arrangement of operations, tools, equipment and supplies is an important part of a good housekeeping cleanliness practices. Also regular inspection is needed for ensuring that the practices are followed at the workplace. The major elements which are normally included in the housekeeping and cleanliness practices at the workplace are described below. Dust and dirt removal – Working in a dusty and dirty area is unhygienic as well unhealthy for the employees since there can be respiratory type irritations. Also, if dust and dirt are allowed to accumulate on surfaces, there is a potential for a slip hazard. Hence, regular sweeping the workplace for the removal of dust and dirt is an essential housekeeping and cleanliness practice. Further, compressed air is not to be used for removing dust or dirt off employees or equipment. Compressed air can cause dirt and dust particles to be embedded under the skin or in the eye. Employee facilities – Adequate employees’ facilities such as drinking water, wash rooms, toilet blocks, and rest rooms etc. are to be provided for the employees at the workplace so that employees can use them when there is a need. Cleanliness at the place of these facilities is an important aspect of the facilities. Flooring – Floors are to be cleaned regularly and immediately if liquids or other materials are spilled. Poor floor conditions are a leading cause of accidents in the workplace. Areas such as entranceways which cannot be cleaned continuously are to have mats or some type of anti-slip flooring. It is also important to replace worn, ripped or damaged flooring that poses a trip hazard. Lighting – Adequate lighting reduces the potential for accidents. It is to be ensured that inoperative light fixtures are repaired and dirty light fixtures are cleaned regularly so that the light intensity levels are maintained at the workplace. Aisles and stairways – Aisles and stairways are to be kept clear and not to be used for storage. Warning signs and mirrors can improve sight lines in blind corners and help prevent accidents. It is also important to maintain adequate lighting in stairways. Further stairways need to have railings preferably round railings for adequate grip. Spill control – The best method to control spills is to prevent them from happening. Regular cleaning and maintenance on machines and equipment is an essential practice. Also, the use of drip pans where spills might occur is a good preventative measure. When spills do occur, it is important to clean them up immediately. When cleaning a spill, it is required to use the proper cleaning agents or absorbent materials. It is also to be ensured that the waste products are disposed of properly. Waste disposal – The regular collection of the waste materials contribute to good housekeeping and cleanliness practices. It also makes it possible to separate materials that can be recycled from those going to waste disposal facilities. Allowing material to build up on the floor wastes time and energy since additional time is required for cleaning it up. Placing containers for wastes near the place where the waste is produced encourages orderly waste disposal and makes collection easier. All recyclable wastes after their collection are to be transferred to their designated places so that the waste materials can be dispatched to the point of use or sold. Tools and equipment – Tools and equipment are required to be inspected prior to their use. Damaged or worn tools are to be taken out of service immediately. Tools are to be cleaned and returned to their storage place after use. Maintenance – One of the most important elements of good housekeeping and cleanliness practices is the maintenance of the equipment and the buildings housing them. This means keeping buildings, equipment and machinery in safe and efficient working condition. When a workplace looks neglected then there are broken windows, defective plumbing, broken floor surfaces and dirty walls etc. These conditions can cause accidents and affect work practices. It is important to have a replacement program for replacing or fixing broken and damaged items as quickly as possible. Storage – Proper storage of materials is essential in a good housekeeping and cleanliness practice. All storage areas need to be clearly marked. Flammable, combustible, toxic and other hazardous materials are to be stored in approved containers in designated areas which are appropriate for the different hazards that they pose. The stored materials are not to obstruct aisles, stairs, exits, fire equipment, emergency eyewash fountains, emergency showers, or first aid stations. Also it is important that all containers be labeled properly. If materials are being stored correctly, then the incidents of strain injuries, chemical exposures and fires get reduced drastically. Clutter control – Cluttered workplaces typically happen because of poor housekeeping practices. This type of workplace can lead to a number of issues which include ergonomic as well as injuries. It is important to develop practices where items like tools, chemicals, cords, and containers are returned to their appropriate storage location when not in use. Clutter is not only unattractive but, in a work area, it is also a serious threat to safety. Danger to the employees increases if the established exit routes and doors are blocked. For this reason, as well as to prevent slips and trips, assorted waste materials need to be disposed of promptly in the appropriate waste containers. Aisles are to be kept clear of obstructions for obvious reasons. Individual workspace – Individual workspace need to be kept neat, cleared of everything not needed for work. Many workplace injuries occur right in the employee’s workspace. This space is often overlooked when conducting general housekeeping and cleanliness inspections. 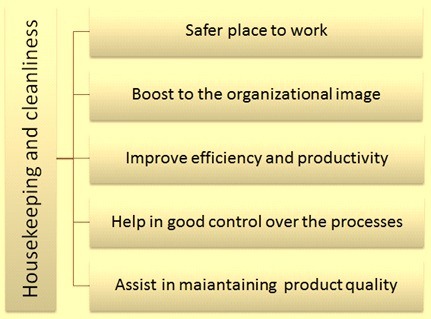 It is necessary to make a checklistwhich is to be used by the employees to evaluate their workspace. Through healthy housekeeping and cleanliness practices, the organization not only keep the workplace neat and clean, but also save on a whole lot of resources which in turn helps in improvement of the profitability of the organization. All the employees of the organization play an integral role in housekeeping and cleanliness. It is important to establish a housekeeping schedule. At a minimum, housekeeping is required to be done at the end of each shift. At this time employees are expected to inspect, clean and remove unused or discarded materials. In areas where significant debris build up is possible, it is important to establish a more frequent housekeeping schedule. It is important to train workers to keep their areas clean throughout the shift in order to minimize hazards as well as reduce the amount of time needed at the end of a shift to clean. Like any other process, it is better if the standard operating procedures (SOP) are written for the housekeeping and cleanliness. SOPs ensure that the housekeeping and cleanliness practices are well defined in the organization. This in turn makes it easier for the employees to follow them. Also, housekeeping and cleanliness being an ongoing process, it is necessary that all due measures are taken to maintain the sanity of the workplace. Regular audit, walkthroughs and inspection schedules need to be put in place since these in turn help in sustaining good housekeeping and cleanliness practices in the organization. Good housekeeping and cleanliness practices are normally difficult to maintain since there are pervasive problems. Additionally, a few individual employees who are not committed to housekeeping and cleanliness practices can make a significant difference. Hence, continuous, unrelenting management attention to this issue is necessary to achieve and maintain the desired level of housekeeping and cleanliness in the organization. It can be said that a clean work area demonstrates the pride employees have with the job and the culture of safety at the workplace.